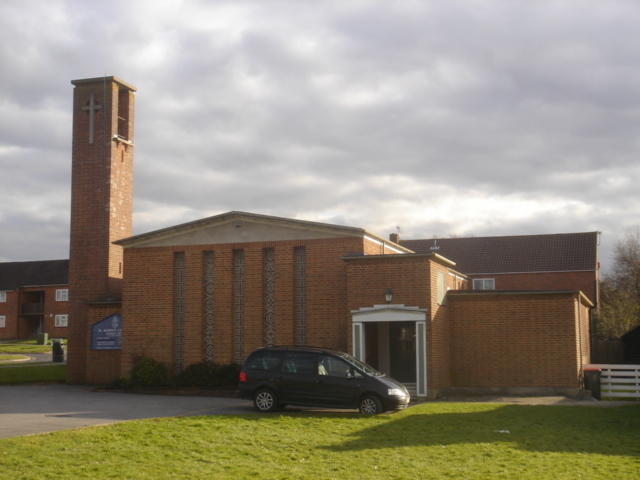 Though built as late as 1961-62, St Alban’s is the most conservative in style of the earliest group of churches in Crawley. Designed by T F Ford (TCA 3 p112) on a conventional aisled plan, it has a vestigial west pediment, long windows, including those of the chancel and clerestory, and a pylon-like west tower. The aisles are little more than passages and the walls inside are painted in pastel colours. The patterns of coloured glass set in concrete panels of the west windows (see below) add much needed vigour to the interior, as does the vivid red cross with the instruments of the Passion on the east wall. The church was re-ordered in the 1990s with a central altar and chairs in place of the pews. Like other fittings that were in the church originally, these looked re-used. Glass: (West and other windows) Goddard and Gibbs, 1961. Dalle de verre. (DSGW 1972). Stations of the Cross: (Both aisles) M Coles (church website).